This treadmill, designed and build in USA is one of the best suited exercise equipment for employees, residents and other corporate personal, who donot get much time a morning walk or jogging. An innovative QR code offers easy access to workouts and information via any smartphone – to help everyone reach their ﬁtness goals faster. Its optional high definition E3 View monitor offers three viewing modes on a 15.6” embedded touch-screen display. Cybex Engineering and Performance - The 525T treadmill is built with premium materials such as US steel. ARMZTM stability bars, IS3 Intelligent Suspension System, powerful 5 HP Peak AC motor are used for a smooth, and comfortable workout with minimal stress and impact. 525 series – the new cardio line from Cybex– The 525 Series offers the industry leading commercial-level quality. It is a reliable product and its console designed to provide an intuitive, accessible layout for users in managed and unsupervised environments. User -Friendly Technology – Use of QR codes in the Cybex 525 cardio machine provide users with easy access to equipment information and workouts via a mobile device. One can select its special features, cardio workouts that best meet their fitness goals. The optional high definition E3 View monitor offers three viewing modes on a 15.6” embedded touch-screen display. Running Area : 22" x 60"
Elevation Range – 0% – 15%. ToughTrain 4.0 out of 5 Bit over pricy but it has all latest, useful and motivational features. Can be smart buy if you get some more discount. *Note: Most of the sites, stores or shopping portals listed above sell Cybex 525T Treadmills with discounts and other exciting offers. There is a possibility that the some of above websites are not selling Cybex 525T Treadmills now. Toughtrain.com is not liable for such cases or instances. 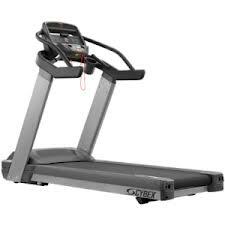 Also we do not recommend any seller for Cybex 525T Treadmills and a buyer should buy from where he/she gets best deal with quality of products, service and on time delivery (shipment).